The single most important factor in hitting a true and accurate golf shot is the grip. The grip largely determines the position of the club face and thus to a large degree affects whether it will be square to the direction line. If the clubface is open or closed, it will be responsible for sliced and hooked shots respectively. Just a small change of millimeters in the golf grip can make a substantial difference in the angle of the clubface striking the ball and hence the distance hit. All too often beginners will make the common fault of holding the club entirely in the fingers of the left hand. This leads to the left hand being too much on top of the grip, with the right hand positioned too much under it. One of the most common faults with the grip relates to holding the club entirely in the fingers of the left hand, placing it too much on top of the shaft, and placing the right hand under the shaft. This can feel natural because it feels more powerful but the tendency with this incorrect grip is to roll the left hand over as the club makes impact with the ball. This results in a closed face and leads to a hook. Thereâ€™s also a tendency for the left hand to be bent back at the top of the swing with the left wrist under the shaft. In this position the clubface is open at the top of the swing leading to a sliced shot. Equally a slice will manifest itself when the player tries to prevent the clubface from turning as he hits through the ball. The correct grip is based on having the palms squarely face each other. As the player takes hold of the golf club with his left hand it should make diagonal contact acrosss the palm from the crook of the index finger. In closing the hand around the shaft it’s held in the first two fingers and palm. At this point one will see a fold of flesh between the club and the little finger. Known as the palm and finger grip you can use the appearance of the fold as a check point. The next check point is to ensure that when the left hand is closed tightly on the club you can only see the two knuckles at the base of the index finger and the big finger. Once the left hand is in place on the club the right hand can be slide under the shaft with the palm up and fingers extended. Then close the hand, moving it so as the third finger of the right hand fits against the left hand index finger. The right hand little finger should lie on top or overlap the left index finger. The right hand holds the club with the root of the second and third fingers. This prevents the hand from loosening at the top of the swing. The index finger hooks low around the club, being separated slightly from the middle finger. It is important to ensure that the crook made by the right index finger is father down the club that the end of the right thumb. Also there should be definite contact between the right hand forefinger and the tip of the thumb. This grip will allow you to maintain a tight contact with both hands at all stages of the golf swing. This is achieved by practically having all the fingers on the club, specifically the last three of the left hand and the first threee of the right hand. Hi Andy, Ive been receiving your generous tips without subscribing any of your items. What a shame. Anyway I tank you very very much for being patient with me. 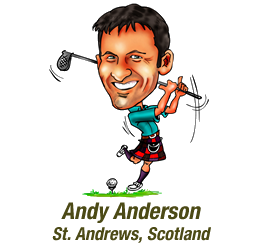 One of these days, before my golfing days is over, I will make it up to you by visiting you in the home of golf, St. Andrews, which is my ambition. I will let you know definitely. I have been following your tips but there are just too many to remember that you tend to forget once in the course. One thing though that I missed from your tips is the fact of hitting the ball. Do you hit it with your right hand being dominant for right handers or purely by your left hand even if you are a right hander. I hope you get what I mean. This is one thing that bewildered me and I guess to lots of other golfers. Thanks once again Andy. Hope to see you soonest. First time golfer trying to understand the game!! !